“We want restaurant Team Members to feel good about what they put on every day,” says Rissier, Chick-fil-A Service Innovation Manager. “We want them to feel self-confident, not self-conscious.” To do that, Rissier looks to a team of expert designers, the U.S. Military and within Chick-fil-A restaurants. Rissier knows getting the uniform right is crucial. When Chick-fil-A asked restaurant employees about their uniforms, 87% said they were one of the most important factors in their overall job satisfaction. To get it right, Rissier calls on seasoned design partners, as well as the people who will be wearing the uniforms, to create a custom head-to-toe program, from hats and caps to socks and shoes. Restaurant Operators and Team Members sit on a council to represent the different style preferences of workers in 2,200 restaurants in 48 states. And when customers visit restaurants in varying cities and states, they’ll notice a difference. Restaurant teams may select the style and color of their uniforms, including insulated parkas in colder climates, to designer shorts and moisture-wicking shirts where it’s warm. People in leadership roles pick from an “executive line” of higher-end blouses, shirts and ties, which Rissier says may help inspire Team Members to stay and advance in the restaurant. Chick-fil-A has even partnered with a company that makes military equipment to produce a special cold/hot pack that employees can wear. It protects them from extreme temperatures and keeps them hydrated while taking orders outside in the drive-thru line (they can fill it with iced water – or even hot coffee - and drink from it!). 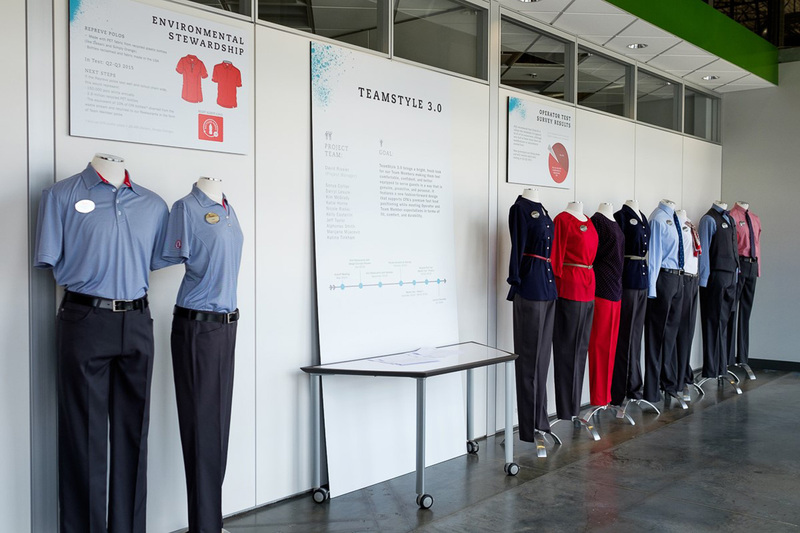 Chick-fil-A’s uniform design extends far beyond the practical, in-restaurant benefits – it even makes an impact on the planet. In 2016, Chick-fil-A began to produce uniform polo shirts made from 100-percent recycled plastic bottles. Each Team Member polo is made of nine-to-nineteen recycled bottles, saving 7 million bottles from U.S. landfills since the program began. “It’s encouraging that one day we’ll look back on this and know that we played a part in doing something really good for the planet,” says Rissier. 1980s to the comfort-first mentality of millennials, every season and decade brings something new.While fashion at Chick-fil-A restaurants is little-known compared to its Original Chicken Sandwich and friendly customer service, what restaurant Team Members wear at work is really a sign of the times.